Do you believe in miracles? Are you familiar with the term ‘Law of Attraction’? A Course In Miracles says a miracle is simply a ‘shift in perspective’. As always, I want to be transparent with you… I’ve been diving deep into the process of my own personal development, both inner and outer work over the last few years, you may relate to this too. Some of this is about my physical journey of living with a disability, understanding and owning my relationship with this part of me. Redefining my identity as a Mama who’s children have flown the nest, challenges with my romantic relationship, the decision to set myself free and selling up my home, the coaching world and my place within this changing industry, peri-menopause and the shifts I’ve noticed in my body… getting clear on what’s important to me now. I’ve definitely felt ‘off centre’ at times and decided to take a semi break from social media. Sometimes it just feels too noisy, does that make sense? That’s included a break from our Facebook group Global Fab Friends, I’ve not been in the group for many months and that was a conscious decision to give back to myself. It’s by taking control of your own life that you, re-connect with your spirit, honour your vales and begin to feel refreshed and vital once again. It’s like ‘coming home’ to yourself. I’m going to be sharing more about my journey in the coming weeks, as I think it may resonate with you – and help you too. When you make the decision to embark on a personal development journey, it’s a never ending process as you notice and unpick the patterns of thought that hold you back (limiting beliefs) and make sense of the life you’ve created for yourself. I made a financial investment to get the support I needed, as I was going around and around in circles. I’m so glad I did! Now feeling this gorgeous sense of vitally again, high vibing, honouring myself, I’m finding the miracles are coming thick and fast once again. You could also say these are synchronicities, coincidences, the Law of Attraction at play or even luck – and you’d be right. There is no one way to describe them. So what have the big ones been in the last 3 weeks? First Miracle: Well, as you may know, I’ve been on holiday to Barbados. My partner and I had booked seats in premium economy – I’ve always wanted to fly Upper Class but it’s not been been something we’ve done. I always ask to have a look behind the curtain before I leave the plane and I’ve promised myself I would one day travel this way. Can you imagine my surprise when we checked in our suitcases at Gatwick airport, we were told that the seats in premium economy were over booked and we had been chosen for a complimentary upgrade to Upper Class! I couldn’t believe my good fortune! I was SO excited!!!! A dream come true for sure. I had an intuitive download, that this was gift from the Universe, for finally after 40+ year of denying my condition, being rewarded for having the courage to ask from airport assistance for the first time in my life. To no longer struggle if I didn’t need to – being open to receiving and having my needs met. 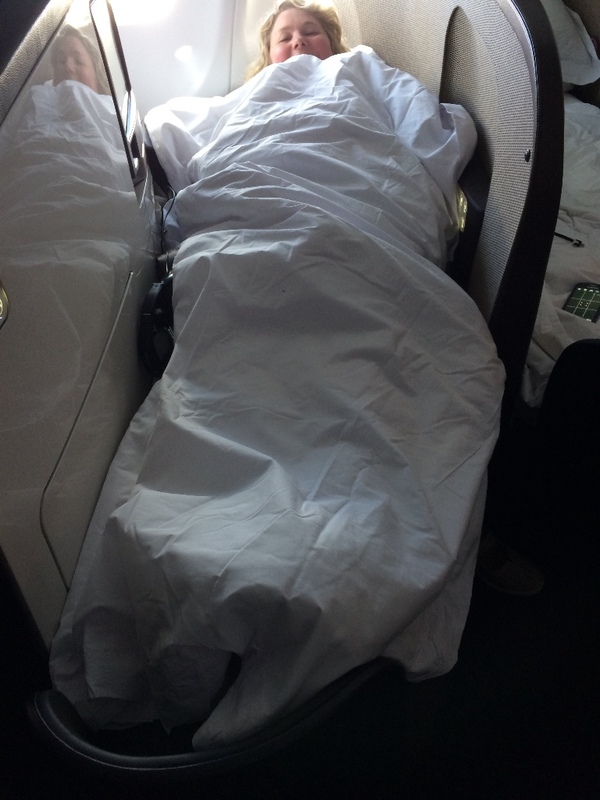 Being able to sit with my feet up was fabulous for my challenged ankle joint – and to have a sleep on a flat bed as the plane flew through the sky was just surreal! I felt so full of gratitude for this incredible gift and had such a spring in my step when I got off the plane. 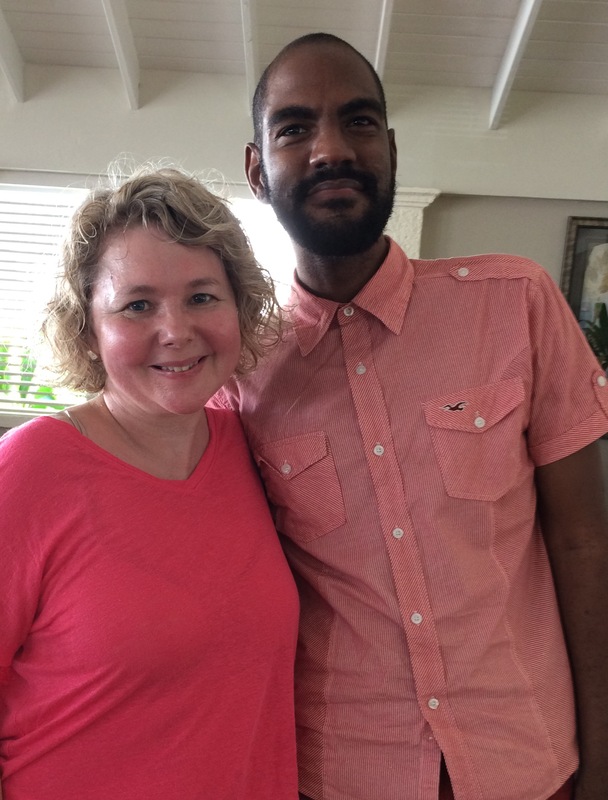 Second Miracle: Since our last visit to Barbados 2 years ago, I’m connected with a Barbadian chap called Justin via Instagram (I love that social media platform). I didn’t say where I was staying on Instagram… but secretly I hoped that I’d meet him on my visit. On my second morning, I caught a glimpse of someone who looked like Justin in the buffet restaurant, getting his breakfast. I told my partner that I thought it was Justin… my heart fluttered with excitement and I felt my face glowing red. What were the chances of that meeting? Of all the hotels, restaurants, cafes in Barbados, what were the chances of him being where I was staying? And us both being there at the same time in the morning? Again nothing short of – miraculous. 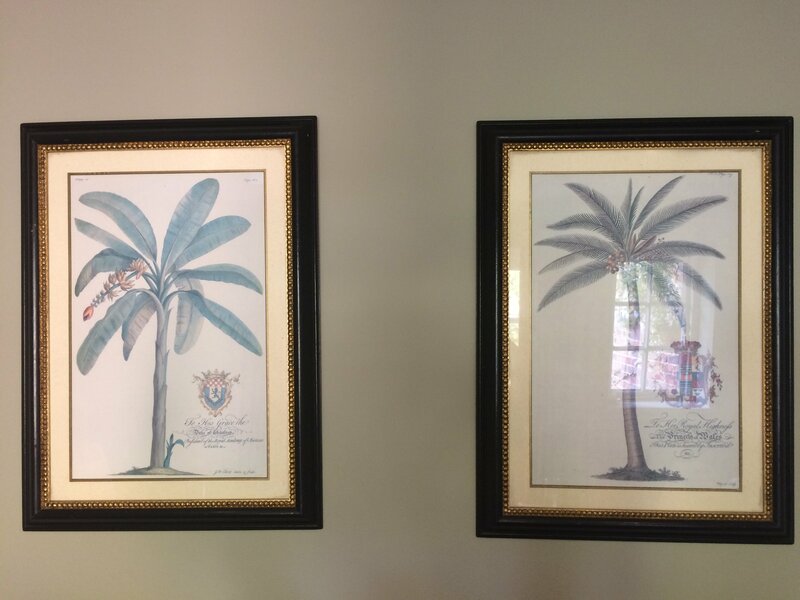 Third Miracle: In our hotel room and around the hotel, there were somebeautiful prints of coconut trees and banana trees – each with a special dedication of a member of the royal family. I admired and studied them greatly… Last Friday, back in the UK I went to meet with my peers for our quarterly Mastermind Meeting – to a sleepy pub/hotel we’d been to so many times before in Yattendon, Berkshire. I chose to sit in a different place to my usual seat, as I was the first to arrive. And straight in front of me… were the same pictures! The coconut trees and banana tress – with the dedication… No way! Yes way! I Googled them later and found they were from a The Natural History of Barbados book, dated 1750! How bizarre that they would be there in Berkshire – and I’ve been in that room so many times before and never seen them. Each of these, feel like miracles and they fill my heart with joy, I feel expanded, alive and now – again I’m expecting miracles to unfold. Miracles come in so many different ways, big and small. They remind us that the Universe has our back… The inner work that I’ve been doing is now rewarding me in so many different ways! Are you open to miracles? I’m playing with the idea of hosting an intimate retreat in Barbados next year – I feel a deep connection with this tiny, paradise, Caribbean island and I think you would too. Go on, let me know if this excites you, too? Doing this inner work, clearing out your out dated beliefs and making sense of how life is now… what you really desire for yourself moving forward isn’t for the faint hearted. I didn’t do it alone, that’s almost impossible. Even as an empowerment coach, I invested in support to have someone witness me, stretch me to think in new ways, to open myself up to what is possible and to rise up again. If you’d like to have a conversation with me about how I could help you to rise again – message me at ali@alisoleil.com and we’ll set up an informal call to explore if we’re a good fit for each other. Here’s to the miraculous and creating the life you desire!